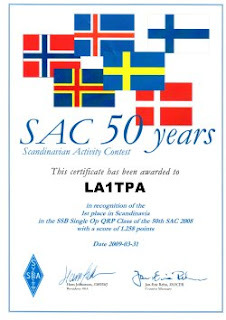 This morning my certificate from the Scandinavian Activity Contest 2008 arrived. I managed to get 1st place in Scandinavia in the SSB single Op QRP class. I'm not sure I will be able to work the contest this year as I'm scheduled to work that weekend.